This kitchen replaced the original that we believe was destroyed by fire. It was built in 1880. The centre of activity on the property, it was a meeting place for owners and staff and a place where instructions were given for the day’s work. At the height of the Reynolds era, the property would have had many employees who, as part of their earnings, received a midday meal. 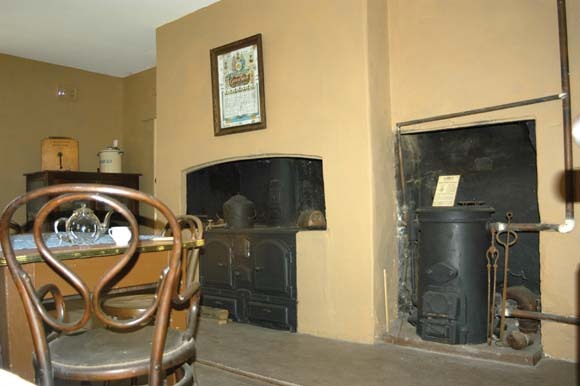 The kitchen, with its particularly large wood-fired stove, could easily cater for up to 25 people daily. It was commonplace in the 19th century for entire families to live and work on a property; with male members labouring outdoors and female members working in domestic roles such as cleaning, serving and preparing food. On Tocal, this was true for generations of the loyal Kidd family. The coke-fuelled boiler and the copper hot water storage tank are housed on the wall in the kitchen. The scullery, off the kitchen, was used for food preparation. The large stone slab on which food was prepared slopes towards a drainage outlet through the wall. Tocal was self-sufficient in produce so everything grown on the property was processed in the kitchen or nearby. The kitchen contains a milk separator and a butter churn that were used in the milk room for making butter from the rich Tocal milk. A drip safe for keeping food cool in the days before electric refrigerators is also on display.